Bonnie shared with us her lovely bathroom lighting project. This lifestyle blogger has exquisite taste; just take a look at her social media accounts! With more than twenty thousand followers, her opinion is taken with high esteem. So, when she shared her project with us, we knew we had to share it with you! She used the Beaumont ceiling medallion as a way to spruce up her bathroom remodel. Pairing it with a lovely woven pendant light, her project looks absolutely adorable! 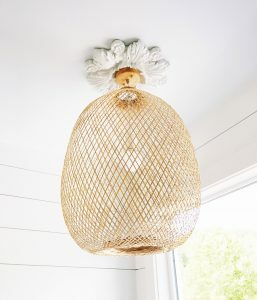 Whether she meant it or not, her project reminds us of a chic pineapple! Our last pineapple-esque project had an exterior application, while this one has a great lovely interior application. When you want to enhance your ceiling, the Beaumont ceiling medallion promises to add bold style to that often neglected space above our heads. The Beaumont ceiling medallion features a stunning radial floral design that is sure to give your ceiling character. The Beaumont is an interesting alternative to the circular medallions, and literally seems to burst forth from the flatness of your ceiling. The Beaumont will leave a lasting impression on your guests. The Beaumont ceiling medallion’s highly detailed relief design lends depth and texture in the central bloom, the lush foliage, and the six smaller blossoms that complete the design. The Beaumont ceiling medallion is not only striking, but durably constructed of high quality urethane. For the full collection of ceiling pieces, take a look at the link below!